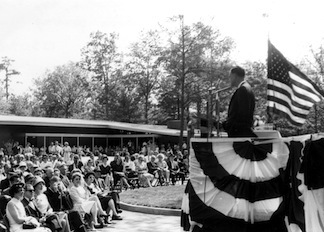 In 1957, the FSNMP master plan called for the addition of a visitor center at Chancellorsville to replace the contact station built by the CCC. Original plans called for placing the building on the south side of modern Route 3, but the state highway department began discussing the possibility of widening the road, placing two new lanes south of the two lanes already in existence. Park historians expressed concern that placement of the visitor center south of the road would infringe on the historic woods where so much of the worst fighting took place on May 3—“the heart of the battlefield,” the superintendent later called it. Severe infantry action, which involved a great deal of back and forth movement, took place on both sides of the highway. A definitive study would, however, probably prove that there was more movement involving larger numbers of men on the south side. In addition, Fair View, the cornerstone of Union defense on May 3, was south of the road. This position was attacked not only in front, the West, but also from the South. Confederate artillery at Hazel Grove supported both attacks. The development, as now planned, would unquestionably intrude upon the scene to a greater degree than if it were moved north of the present highway. Recall also that the State Highway Department proposes to widen on the critical side. By virtue of its land holdings south of the road, FSNMP already recognized that the area represented an important part of Chancellorsville’s story, and historians did not want to violate the integrity of that story. By that argument, though, Happel’s contention that the wounding site was “the plum in the pie” would suggest that the visitor center shouldn’t go there, either, because important ground shouldn’t be compromised. But if both pieces of ground were important, then apparently, to paraphrase Orwell, some ground was more important than other. The north-side location was settled on—not to avoid “the heart of the battlefield” so much as to plumb the pie, as it were, acquiescing to the drawing power of the Jackson Monument. 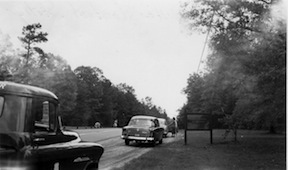 Happel and his colleagues recognized that visitors would go see the monument whether they had to cross the road or not. that Lee’s failure in Gettysburg resulted from the loss of his “brilliant subordinate” Stonewall Jackson at Chancellorsville. He closed the same remarks by referring to the Jackson Shrine, saying that “quite a few historians think that the course of History changed in that cottage” where Jackson died. Happel’s draft remarks mirror what the Chancellorsville Visitor Center’s exhibits focused largely upon, with the Lee-Jackson story taking priority over an account of both the Confederate and Federals strategies and actions during the battle. The physical location of CVC presented enormous interpretive challenges for Chief Historian Thomas Harrison, who took over a year after CVC’s dedication. Chronologically, Jackson’s wounding takes place on the night of May 2, halfway through the overall battle, yet suddenly that story took center stage as the starting point for visitors coming to the battlefield. “The martyrdom of Jackson” storyline had a powerful physical embodiment on the landscape. With the sesquicentennial of the Battle of Chancellorsville upon us, we’ll suspend our series for a few days in order to provide you with focused coverage of the anniversary. Look for the series to resume next Monday. 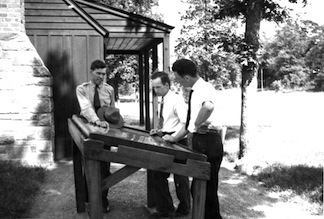 For an extensive, well-written look at this story in depth, check out Eric Mink’s four-part series, “Park Development: Chancellorsville Battlefield Visitor Center” at Mysteries & Conundrums: < http://npsfrsp.wordpress.com/2010/05/17/park-development-chancellorsville-battlefield-visitor-center>. Northington, Jr., O.F. Memo to Regional Director, Region One. Memo dated 3 November 1958. FSNMP files. Northington, Jr., O.F. Memo to Regional Director, Region One. 15 January 1959. FSNMP. Memorandum from Happel to Superintendent Northington, 22 December 1958, quoted in Zenzen, 153. Hennessy, John. E-mail to author. 8 May 2012. This entry was posted in Battlefields & Historic Places, Battles, Memory, Monuments, National Park Service, Preservation and tagged Battle of Chancellorsville, Chancellorsville, Chancellorsville battlefield, CVC, Fredericksburg & Spotsylvania National Military Park, FRSP, FSNMP, Jackson Wounding monument, Memory, National Park Service, NPS, Preservation, Shaping-Chancellorsville. Bookmark the permalink.